Glasvegas singer James Allan has promised bandmates he will turn up for the band's US tour after going missing. Allan went Awol four days ago and missed the Mercury Music Prize, where the Scottish rock band were nominated. But he got in touch soon after the ceremony on Tuesday to say he was safe. He did not reveal where he was or why he took flight. But he pledged to be on stage for their first US date supporting Kings of Leon in Massachusetts on Friday. 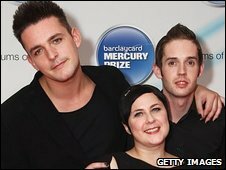 Speaking at the Mercury ceremony, Glasvegas guitarist Rab Allan, James's cousin, told The Daily Record newspaper that the singer "needed a break" and his disappearance caused "panic" among the rest of the band. "He has been working really, really hard," he said. "I miss him. The message is: 'Please get in touch.'" The other three band members are now en route to the US from London. The Mercury Prize was won by hip-hop star Speech Debelle for her debut album Speech Therapy.